Demonstrators called for a minimum hourly wage of $15 outside the Marriott Downtown hotel in Des Moines on Jan. 28, the same day as a Republican debate. As New Hampshire gears up for the first primary in the country next week, fast-food workers there are planning to walk off their jobs on Saturday, the first time workers in the state have joined the nationwide fight for a $15 per hour minimum wage. The strike will culminate at a rally in Manchester, where the Republican candidates are debating that night. 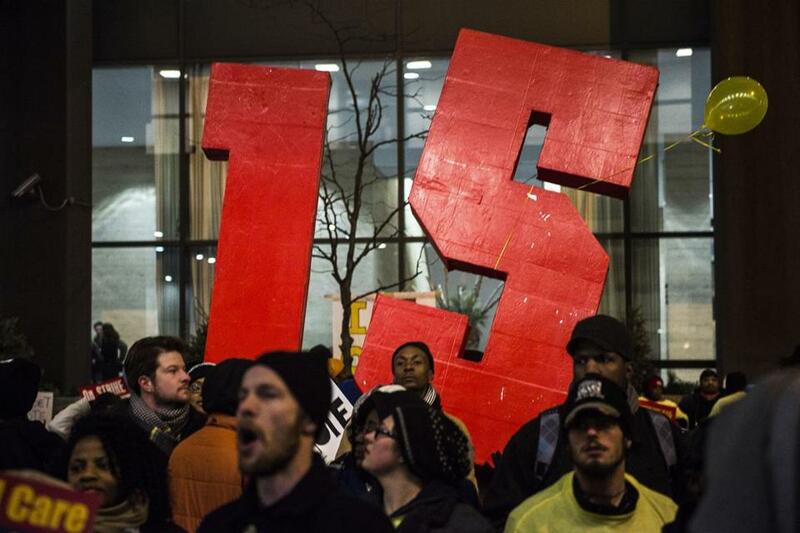 The “Fight for $15” movement, which has helped spark wage increases around the country, has ramped up during the presidential campaign. Organizers with the Service Employees International Union, which is coordinating the workers and trying to unionize them, have staged protests to coincide with debates in Iowa, South Carolina, and Wisconsin and force politicians to pay attention to low-wage workers. The first question at the Republican debate in Milwaukee in November was about a $15 minimum wage, which is more than double the federal minimum wage of $7.25 an hour. None of the Republican candidates has come out in favor of a $15 wage. On the Democratic side, Senator Bernie Sanders has embraced it. Former secretary of state Hillary Clinton has called for a $12 minimum but said $15 could work in certain cities. Nearly half the workers in New Hampshire, about 281,000 people, make less than $15 an hour, according to an analysis of Labor Department data by the fast-food campaign. Many of them, like Megan Jensen, a 26-year-old KFC employee in Manchester, have never voted but plan to go to the polls this year. Jensen is skipping her $8-an-hour shift on Saturday to participate in the rally. She said she wants politicians to listen to workers’ struggles but declined to say which candidate she will support. “Whoever is willing to work on our issue will have my vote,” she said. A supervisor at Jensen’s KFC store declined to comment on the worker protest. Many business groups are strongly opposed to a $15 minimum wage, saying it will burden small-business owners and lead to job losses. A recent survey released by the conservative Employment Policies Institute in Washington, D.C., found that 80 percent of fast-food franchise owners would likely reduce hiring, while 90 percent of hotel franchise owners would raise room rates to offset the increased labor costs of a $15 minimum wage. “Fight for $15” organizers plan to continue following the presidential campaign , staging rallies before debates and primary votes throughout the year.